I'm just one man. One man with limited time and financial means. I would love to visit more places than I do, but even in a mid-sized metropolitan area like Boise, there are a lot of eateries to choose from. I will sometimes catch some static about which places I choose to visit and when, but there are a lot of factors. First of all, the tastes and cravings of the people I'm dining with often come into play. Then there is the location factor; if you're close to my home or work, I'll probably get around to you more quickly. If it's a place I'm really interested in, I will go out of my way. Sooner or later. Of course, I get recommendations for places to hit from people on Facebook, through e-mails to my site, from people I know in everyday life who are aware of this little hobby of mine...and of course, every once in a while I'll get an invite from a proprietor or PR person. I keep track of them, and I usually get around to trying the places. It may take a while (sometimes a LONG while). I've gotten hints, suggestions, passive aggressive insults. In at least one case I've gotten continuous, albeit friendly, pleading. It's been going on for quite some time now, the kind of length of time that makes me feel guilty. But here's the thing, the guy is only open from 10 PM until 4 AM and in one of the busiest downtown nightclub areas, and I tend not to be downtown much, especially in that area and during those times. 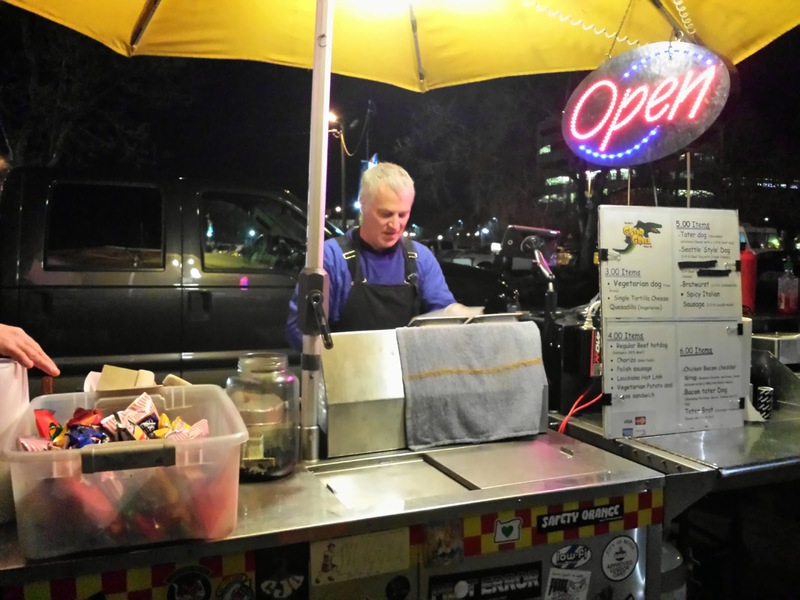 The eatery in question is a hot dog cart called Gator Grill 2. Yes, there is a Gator Grill 1, but they're operated pretty independently of each other. Gator Grill 2 is the one with the social media presence, the one that's actually listed on Urbanspoon and Yelp. David is aware of the importance of utilizing these tools in this day and age. Last year he even offered a free meal to anyone who would post a review on Urbanspoon, even if it was a negative one. In his communications with me, he has good-naturedly mentioned several times that he is aware I could just as easily do a negative review, but despite that he has always encouraged me to show up when he's busy and under pressure. The guy is a professional, and he craves all feedback no matter how positive or negative it may be. Well, it turns out that it wasn't that busy when I stopped by. The crowds hadn't had a chance to spread out from where the party was to where Gator Grill 2 is located, between Main and Grove on 6th Street. David was prepared for a siege though, with a wide array of tubed meat holding at the side of the grill. The prices are very reasonable, with all of the main menu items costing between three and six dollars. Everything from veggie dogs (pretty tasty, according to a vegetarian friend of mine) to 1/4 lb. beef dogs (Nathans!) to chorizo to spicy Italian sausage to bratwurst to Polish to Louisiana hot link. And of course the variations like a Seattle-style dog (with cream cheese) or a bacon tater dog, and even a cheese quesadilla or potato and cheese sandwich for the vegetarians who don't even want to pretend to eat a hot dog. But David also has a signature item, and that's the one he wanted me to try. 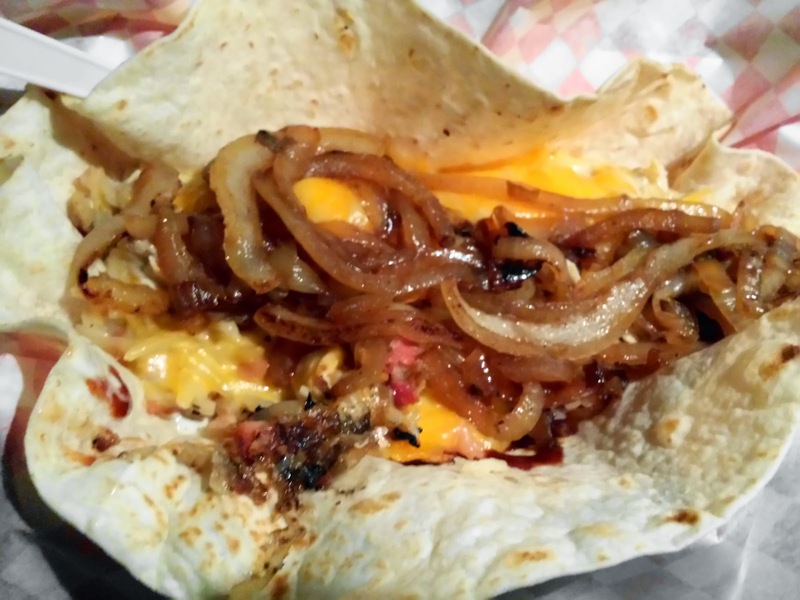 It's called the Chicken Bacon Cheddar Wrap, and it's basically a culinary train wreck on a grilled tortilla. Casually preserving my anonymity, I approached with my best wide-eyed innocent look on my gob and asked David what he would recommend. It was the wrap, of course. "If you're really hungry," he added. I knew what was going into this thing from my previous conversations with David. It has a long history, but if you're interested you should just ask David yourself, he tells it better. In its current incarnation, it includes roasted hand-shredded chicken, shredded potatoes, shredded peppered bacon, a pile of cheddar jack cheese, and a little steam action to melt and incorporate everything. The resulting hot mess is dumped onto the aforementioned grilled tortilla, to which a generous amount of ranch dressing and sweet chipotle barbecue sauce has been applied. Watching this thing being assembled was interesting. There didn't seem to be any rhyme, reason or measuring system involved. Still, it smelled damn good, and when he offered to add some grilled onions into the mix I accepted with nary a second's hesitation, even though grilled onions ALWAYS give me heartburn. The whole thing was put together in less than three minutes, and now that the streets and sidewalks were starting to fill up I decided to go and eat in my car since I'd paid five bucks for the parking space (freaking special event parking). To be fair, I probably wasn't in the best state of mind for trying something new. I'd pulled something in my neck while moving furniture earlier in the day and the pain was spreading upward and turning into an annoying headache. I also wasn't really that hungry despite not having really eaten all day. Though the item is called a "wrap", David had left the tortilla open, so I took the best picture I could using my car's dome light and tucked in. I'd been most afraid of three things given the ingredients and preparation: salt, grease and texture. I needn't have worried. It was a little salty and greasy to be sure, but it was also starchy, sweet, smoky, spicy, tangy...even the little blackened bits from the grill added a pleasant flavor. I'm not exaggerating when I say it was perfectly balanced. No one thing overwhelmed anything else, even the ranch dressing that so many people seem to go a little heavy on. The texture issues I'd worried about with everything being shredded so finely and then steamed (my concern was ending up with a big pile of mush) weren't a problem, either. The potatoes actually came across a little like rice in texture, the chicken held up, the cheese was nice and gooey, and shredded bacon meant getting a little in every bite, rather than pulling half of the filling out by dragging a strip of bacon out with your teeth. This is perfect drunk food, and to be honest I'm a little sad knowing that there's almost no chance I'll be within walking distance of Gator Grill 2 the next time I over-indulge, because I suspect that would only make this food even better.